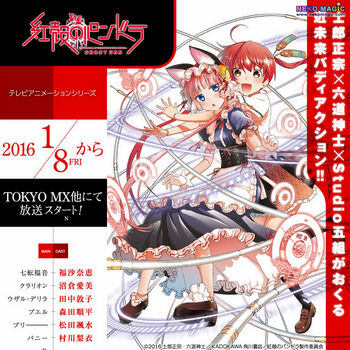 December 31st, 2015 By: GGT Category: 2016 Winter release, Anime News. 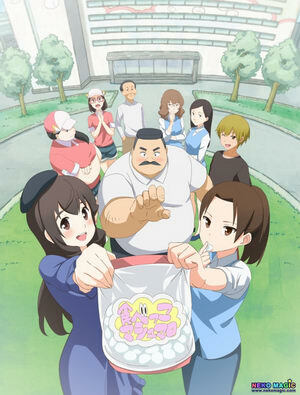 The story centers around Hige, an older man who loves marshmallows, and Wakabayashi, an OL (office lady) who loves Hige. The manga follows as their relationship unfolds at their office. Shouwa Genroku Rakugo Shinjuu revolves around a mature prisoner who was released on good behavior during Japan’s Showa Genroku era. He is called Yotarou by others, a term that means an “anti-hero” or a “dim-witted man.” When he returns to society, he starts a new life in rakugo (comic storytelling). Touched by a performer named Yakumo’s rendition of a story called Shinigami, Yotarou asks Yakumo to take him in as an apprentice to which Yakumo agrees. 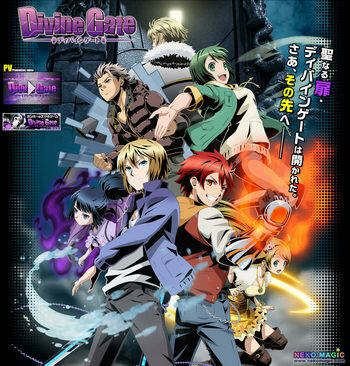 Second planned cour of GATE: Jieitai Kanochi nite, Kaku Tatakaeri. A gate appears in Tokyo’s Ginza district sometime in the 21st century. From the gate pours out monsters, knights from middle-age Europe, and other fantasy-like beings, and they kill many of the citizens of Tokyo. This event is known as the Ginza Incident. 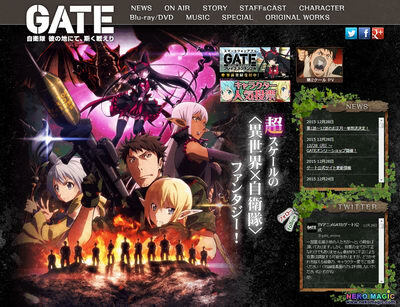 The government sends a small group of soldiers from the Japanese Self-Defense Forces to the alternate world beyond the gate. 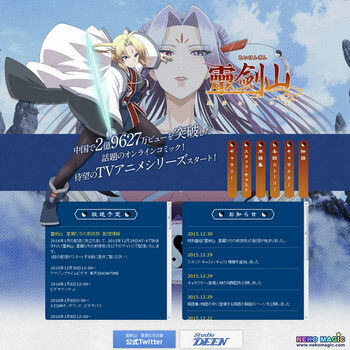 Led by otaku soldier Youji, they find that the villages in the world are being attacked by a dragon. An elf girl who is a survivor from the dragon’s rampage joins the group in their travels across the dangerous new world. 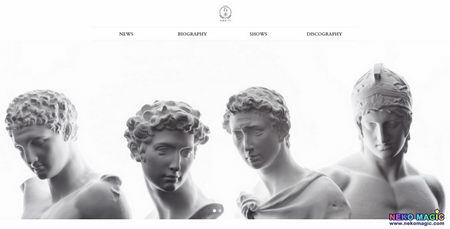 Sekko Boys is a unit of four stone figures — the military saint and group leader Saint Giorgio, history’s original celebrity Medici, the strikingly handsome and multi-talented Hermes, and the god of war Mars who is earnest about love — who become idiosyncratic idols. The story depicts their efforts to make it in the entertainment world with their female manager Miki Ishimoto, who just graduated from college. Oshiete! 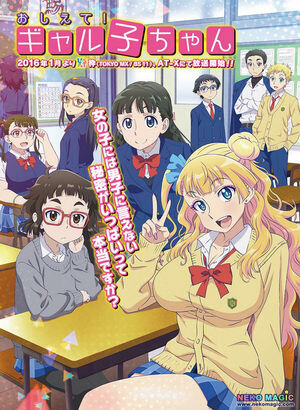 Galko-chan follows the everyday lives of three high school girls who are close friends: Galko, Otako, and Ojō. Galko is a slightly foul-mouthed but good-natured girl who is popular in her class. Her hobby is film appreciation. Otako is a girl who sits in the corner of the classroom, but for some reason is good friends with Galko. Ojō is an airheaded girl who often talks with Galko and Otako. 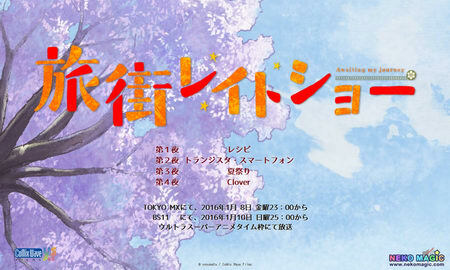 Tabi Machi Late Show will have a theme of “goodbyes and journeys,” and will air four episodes, titled “Recipe,” “Transistor Smartphone,” “Natsu Matsuri” (Summer Festival), and “Clover.” No further information is known. 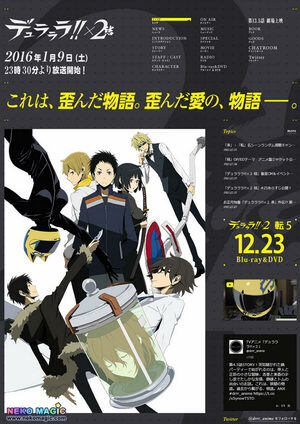 The third and final cour in Durarara! 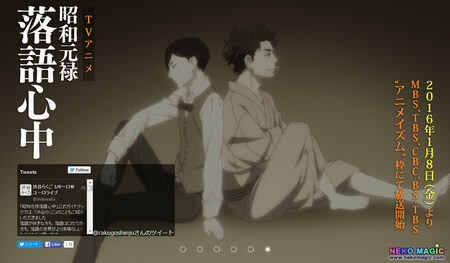 !’s second season. Half a year after the turmoil that rocked the entire city of Ikebukuro, peace has once again returned to the city, and people are living each day normally. The high school students enjoy their days of youth as the strongest and most dangerous man of Ikebukuro works diligently. The informant plots (or plans) a new scheme and the headless rider is pursued by the cops as she rides through the night… But soon this normal will be cut short by the abnormal. Slowly but surely, the unknown will seize the city and face an all new storm.